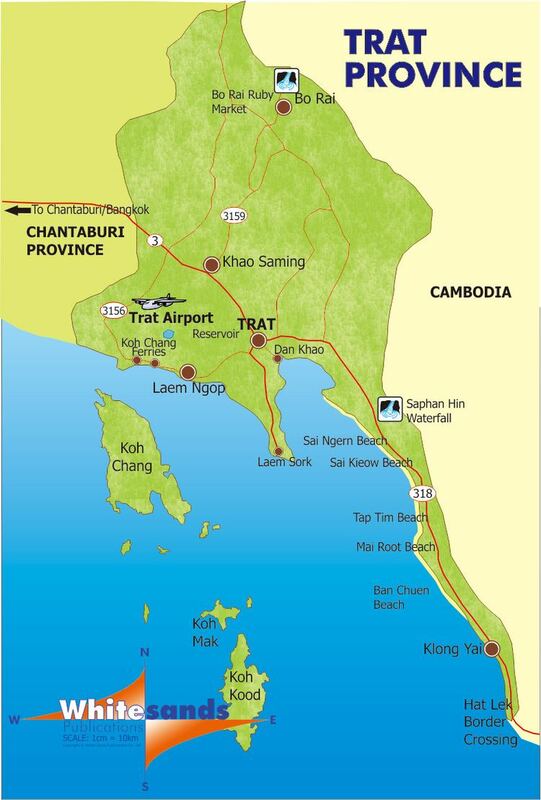 Trat (Thai: ตราด, [tràːt]) is the easternmost province (changwat) along the Thai coast. 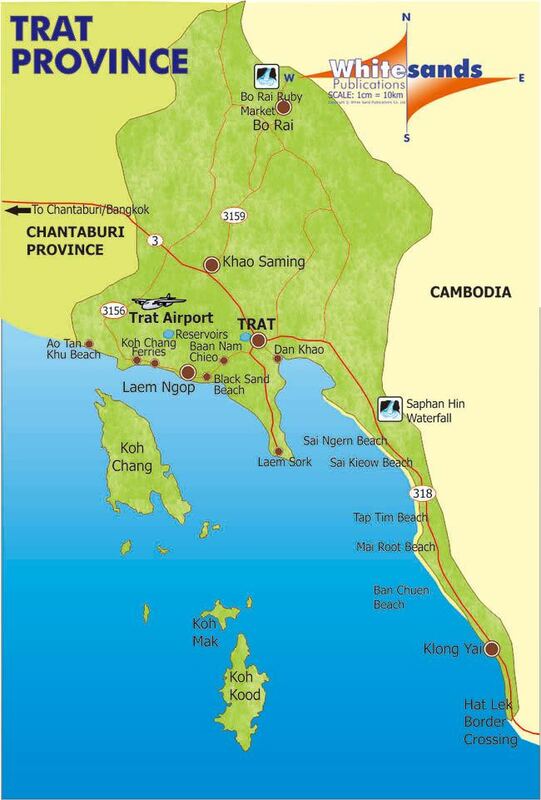 It has borders with Chanthaburi Province to the northwest, Cambodia to the east, and the Gulf of Thailand to the south. Trat is 315 km from Bangkok. 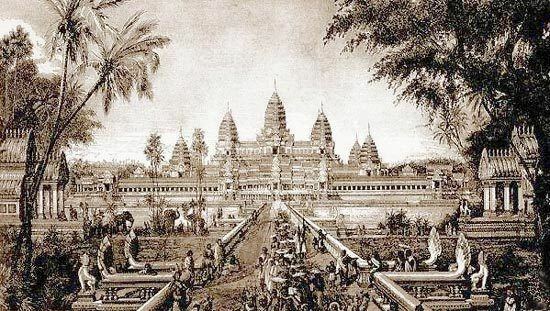 The history of Trat can be traced back to the early 17th century during the reign of King Prasat Thong of the Ayutthaya Kingdom. Formerly known as Mueang Thung Yai, Trat has played an important role in the development of the country’s stability and economy due to its strategic location. The town of Trat later become a community of Chinese merchants. During the French-Thai War of 1940-41, the navy of the Vichy France government in Indo-China sailed from Saigon and attempted to seize Trat. The unprepared Thai warships were caught by surprise. Despite fighting valiantly, by the end of the 17 January battle at Ko Chang, three Thai ships had been left sinking - the HTMS Chonburi, HTMS Songkhla, and HTMS Thonburi. French casualties were light with no ships lost. The Japanese government negotiated a truce, which ended the conflict without further fighting. When the Vietnamese pushed the Khmer Rouge out of Cambodia in 1985, Pol Pot fled to Thailand and made his headquarters in a plantation villa near Trat. It was built for him by the Thai Army and nicknamed 'Office 87". Ao Tan Khu (อ่าวตาลคู่) is a bay with fine sandy beach popular with local people during holidays. Ao Khlong Son (อ่าวคลองสน) is a bay in the northernmost west of the island where Ban Khlong Son community is located, with a beautiful coral reef. Bang Bao Fishing Village (หมู่บ้านประมงบางเบ้า) is a village of houses on stilts built into the sea with bridges connecting them. Most of the residents are descendants of the Salak Phet villagers. The area is an ideal berthing area for fishing boats, with mountains and islands providing shelter from wind and storms in the monsoon season. Ban Rong Than (บ้านโรงถ่าน) is a small community near Salak Phet, south island. It is a scenic viewpoint where the mist-covered peak of Khao Salak Phet in the north and Ko Maphrao Nai and mountains near Laem Yai in the east are visible. City Pillar Shrine (ศาลเจ้าพ่อหลักเมือง) is different from other city pillar shrines because of its form as a Chinese pavilion. Every year on the sixth night of the waxing moon period of the sixth lunar month, there is a celebration called Phli Mueang Day (วันงานพลีเมือง), known among the Chinese as Xia Gong Sae Yit (วันเซี่ยกงแซยิด), which means "birthday of the city pillar God". Ban Hat Lek Border Market (ตลาดชายแดนบ้านหาดเล็ก) is a village on the Thai-Cambodian border. When the fighting in Cambodia was over in 1986, it used to serve as an intermediate marketplace for grain trading between farmers in Cambodia and traders in Koh Kong. Ban Nam Chiao (บ้านน้ำเชี่ยว) is noted for Ngop Nam Chiao, a native hat to ward off the sun. The hat is woven with local palm leaves from plants grown in mangrove area. It is still widely used today as it is light and comfortable. Ban Salak Phet (บ้านสลักเพชร) is a large and the oldest community on Ko Chang. The villagers' main occupation is coastal fishery in an advantageous area sheltered from winds and storms by islands and mountains. There is an old temple in front of the village known as Wat Salak Phet. Hat Sai Ngam (หาดทรายงาม) is an approximately 200-metre long white sandy beach running parallel to a grove of pine trees. Hat Sai Ngoen (หาดทรายเงิน) is a not-so-wide beach with a pine forest more ideal for relaxing or fishing than swimming. Hat Muk Kaeo and Hat Sai Kaeo (หาดมุกแก้ว และหาดทรายแก้ว) have a peaceful atmosphere for recreation. Hat Muk Kaeo is a white sandy beach, which runs from Hat Sai Ngoen to Hat Sai Kaeo, with the shade of pine and coconut trees all along the beach. Hat Banchuen (หาดบานชื่น), formerly called Hat Maro (หาดมะโร), is a beach with delicate sand grains and clear sea water where it is possible to swim. Hat Kai Bae (หาดไก่แบ้) is a sloping and long stretch of beach connecting with Hat Khlong Phrao. Hat Sai Yao (หาดทรายยาว) is near Ao Salak Phet to the south of the island with a long stretch of sandy beach. Ko Chang Naval Battle Memorial (อนุสรณ์สถานยุทธนาวีเกาะช้าง) at Laem Ngop, commemorates the Franco-Thai naval engagement on 17-21 January 1941. There is also a statue of Prince Chumphon, father of the Thai navy, and a warship-shaped museum displaying old equipment and armament of the fleet with exhibits on the Ko Chang naval battle. Ko Pui (เกาะปุย) is an islet not too far from the shore that makes an ideal attraction for relaxation in shady surroundings. It is conveniently accessible in all seasons and is home to coconut groves, herbs, and Dinso Phong (white clay body-powder) mentioned at the time of King Rama V's visit to Trat. Ko Chang (เกาะช้าง), previously an unsettled island, is now important as a harbour for ships to escape from monsoons, and find food or water resources. Ko Chang is the third largest island of the country. Its topography contains high mountains and complex stone cliffs. Ko Chang Naval Battle Site (บริเวณยุทธนาวีเกาะช้าง) - The Trat waters near Ao Salak Phet and Ao Salak Khok also added another page in the Thai history of fighting for the country’s sovereignty. 17 January has become a memorial day for the heroic fighting, of which a service is held annually at Ko Chang Naval Battle Memorial in Amphoe Laem Ngop. Ko Ngam was the first point of confrontation in the Franco–Siamese War in which the French army sent aircraft on a reconnaissance and bombing of the island, whereas Ko Wai is the point where a French patrol aircraft crashed after being fired on by HTMS Songkhla and HTMS Chon Buri. Ko Mai Si is a small private island where there is beautiful nature, sandy beaches and clear water. It is home to diversified marine life and is ideal for diving. Ko Chang Noi and Laem Chang Noi (เกาะช้างน้อยและแหลมช้างน้อย) is in the north of Ko Chang and housing coral reefs between Laem Chang Noi and Ko Chang Noi. Ko Man Nok–Ko Man Nai (เกาะมันนอก–เกาะมันใน) are small islands opposite Hat Kai Bae with surrounding beaches at low tides and golden seaweed in the nearby shallows. Ko Khlum (เกาะคลุ้ม) is an island ideal for fishing with a scenery of rocky areas. Ko Lao Ya (เกาะเหลายา) is a group of islands to the south of Ko Chang including Ko Lao Ya Nai, Ko Lao Ya Klang, and Ko Lao Ya Nok. Ko Wai (เกาะหวาย) is the bay to the north of the island with coral reefs in a perfect condition, whereas the western area of Ao Yai provides home to mostly hard corals and scaly giant clams. Ko Phrao Nok or Ko Sai Khao (เกาะพร้าวนอก หรือ เกาะทรายขาว) is to the south facing Ao Salak Phet. The island has white sandy beaches and shady coconut groves. Ko Ngam (เกาะง่าม) is a twin island connected by a large sand bar located to the southeast of Ko Chang, with an inlet surrounded by the hilly topography where the sea is calm and scenic. Ko Kut (เกาะกูด) is Thailand's easternmost island in Trat waters, the province's second largest island after Ko Chang, and the country's fourth largest island. The topography is generally still in its natural condition, with mountains and ridges forming the headwaters of many streams from which originate various waterfalls. The best-known waterfall on Ko Kut is Namtok Wang Chao. Ko Mak (เกาะหมาก)'s topography is mostly coastal plain with a thicket of coconut groves and rubber plantations. Scenic bays and sandy beaches embracing crystal clear water are all around the island such as Ao Ta Nit, Ao Prong, Ao Phat and Ao Daeng. Ko Kradat (เกาะกระดาษ) has a flat paper-like topography with Alocasia plants, "kradat" in Thai, growing wild in abundance. The island has a long and white sandy beach with beautiful coral reefs. Laem Sok (แหลมศอก) was used as the residence of Kromluang Chomphonkhetudomsak, the father of the Thai Royal Naval Army. Fishing villages are found near the area. Laem Klat (แหลมกลัด) is a white sandy beach sticking out into the sea with not too deep water ideal for swimming. Monkey Training Centre (โรงเรียนฝึกลิง) at Hat Sai Khao provides training as well as shows of monkeys' abilities, especially in collecting coconuts. Mu Ko Rayang (หมู่เกาะระยั้ง) is a group of islands comprising Ko Rayang Nai and Ko Rayang Nok. Ko Rayang Nok is peaceful with white sandy beaches and crystal clear water. Mu Ko Kra (หมู่เกาะกระ) is a group of islets to the west of Ko Mak, a swallow bird’s nest concession area and a diving spot with beautiful corals. Mu Ko Rang (หมู่เกาะรัง) is a group of islets approximately 6 km to the west of Ko Mak. There is not sufficient flat area for human habitation on Ko Rang, which is surrounded by islands of various sizes. Mu Ko Chang (หมู่เกาะช้าง) is located in the middle of the sea and, thus, having an averagely pleasant climate ideal for vacations. Ko Chang is influenced by monsoons from both the northeast and southwest winds, which bar boat access to the island during May–October. 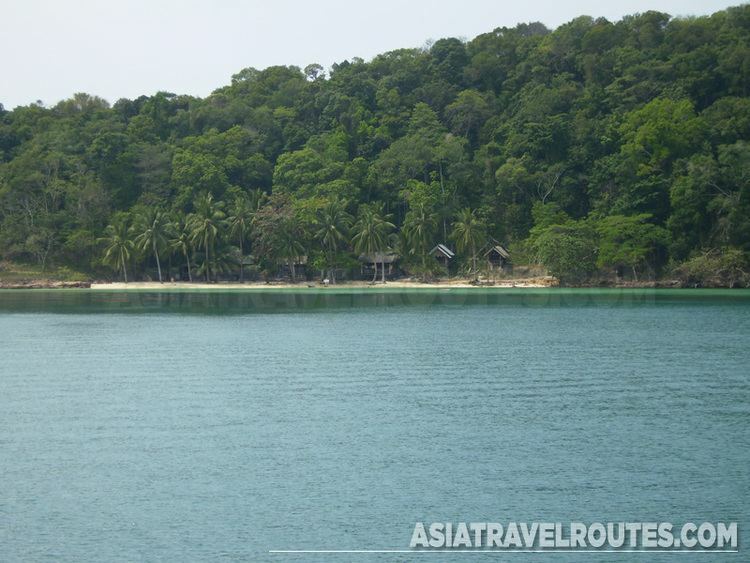 Mu Ko Chang National Park (อุทยานแห่งชาติหมู่เกาะช้าง) covers more than 52 islands. The most famous is Ko Chang. In addition, there are other islands with wonderful nature. Namtok Salatdai (น้ำตกสลัดได) is seven kilometres from km25 of Highway 3157 (Saen Tung-Bo Rai). Namtok Khlong Kaeo National Park (อุทยานแห่งชาติน้ำตกคลองแก้ว) has an area of approximately 65,525 rai (104,840 square kilometres). Namtok Khiri Phet (น้ำตกคีรีเพชร) is a single-storey waterfall located 3 km from Ban Salak Phet community through a rubber plantation. Namtok Khlong Nueng (น้ำตกคลองหนึ่ง) is a small waterfall near Namtok Khiri Phet – Ban Rong Than, located some 2 km deeper inside the island from the Salak Phet Community with another 480 metre walk. The waterfall cascades down from a narrow gorge for 120 metres. Namtok Khlong Nonsi (น้ำตกคลองนนทรี)is a small waterfall to the northeast of the island accessible by a 3 km pathway from Ban Dan Mai or about 4 km from the national park headquarters. Namtok Than Mayom (น้ำตกธารมะยม) is a medium four-tiered waterfall some 500 metres through a garden behind the national park headquarters, with the 3rd tier being the most beautiful. Namtok Khlong Phlu (น้ำตกคลองพลู) is a large waterfall on Ko Chang with water cascading down three tiers of the cliff to a basin, with an entrance located 3 km from Ao Khlong Phrao. Residang Kampot (โบราณสถานจวนเรสิดัง กัมปอต) is a former residence now used as the Office of Probation, Department of Corrections, still in its original architectural style. Thailand's narrowest area (ส่วนที่แคบที่สุดในประเทศไทย) is at Mu 2 Ban Khot Sai, Tambon Hat Lek, on the Trat– Khlong Yai route between km 81–82. The area is 450 metres wide. Wat Buppharam (วัดบุปผาราม) or Wat Plai Khlong (วัดปลายคลอง) is a temple on Plai Khlong Road, which dates from the mid-17th century and features the oldest wooden image hall in the country. The murals are of the early Rattanakosin period. The temple's museum houses ancient relics, Buddha images, and Chinese and European porcelain. Wat Khiri Wihan (วัดคีรีวิหาร) is a temple which features fine architecture with a blend of modern art. Principal buildings inside the temple's precincts include a large Phra Ubosot or ordination hall, Phra Chedi, reception pavilion for HRH Princess Maha Chakri Sirindhorn, monk's residence, preaching hall, and Chinese pavilion enshrining Phra Phuttha Udom Sombun, Bodhisattva Avalokitesvara, and Phra Sangkatchai. Wat Phai Lom (วัดไผ่ล้อม) used to be a resident of Trat's Father of Education, Than Chaokhun Phra Wimonmethachan Worayannurak. The temple also houses a Buddhist garden for public meditation and chedi museum of three much revered monks of Trat. Wat Saphan Hin (วัดสะพานหิน) it is assumed to be more than a hundred years old, although its exact date of building is not known. There is an old Buddhist ordination hall in the water, approximately 1 km from the temple. Wat Yotha Nimit (วัดโยธานิมิตร), also known as Wat Bot (วัดโบสถ์), is the only royal temple in Trat. The temple was once used as a place to hold the oath of allegiance ceremony. There is an old ordination hall of Ayutthayan art serving as a wihan called Wihan Yotha Nimit for storing many antiques. The Ko Chang Naval Battle Day (งานวันวีรกรรมทหารเรือไทยในยุทธนาวีที่เกาะช้าง) is held in late January at the Ko Chang Naval Battle Monument (Anuson Yutthanawi) at Laem Ngop. The event commemorates the bravery of the Royal Thai Navy's action against the French on 17-21 January 1941. Merit-making and tribute rites are performed and there is an exhibition by the Royal Thai Navy. Trat Independence Day (งานวันตราดรำลึก), on 23-27 March, marks the province.s return to Thai sovereignty after the French occupation. The celebrations are held at the provincial town hall.